When Dyncorp of Reston, Va., took over communications for the Navy's Southern California offshore target range (SCORE), one of the requirements was adequate telephone service for San Clemente Island, the range's primary real estate. That turned out to be a tall order. The island lies 80 miles west of San Diego in the Pacific Ocean, connected to the mainland by inadequate trunk lines and a pair of microwave links. The island itself is wired with World War II-era copper. 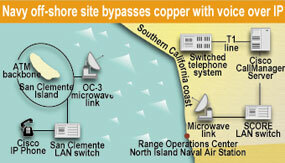 The island did have a fiber-optic asynchronous transfer mode data backbone with IP gateways, however, and the microwave link provided a 155-Mbps OC-3 ATM connection to the range's Operations Center at North Island Naval Air Station in Coronado, Calif.
About a third of the 300 telephone numbers on San Clemente Island are served by voice over IP equipment. After fire and police services, the Navy was an early adopter. When the center found that upgrading a private branch exchange switch from Lucent Technologies Inc. of Murray Hill, N.J., would cost $200,000, officials decided to put voice service on the IP network. 'It was easy compared with completely refurbishing the copper,' Johnson said. Today, about a third of the 300 telephone numbers on San Clemente Island send voice traffic over IP. Some of the first installations on the island were at the fire and police stations, which use IP phones from Cisco Systems Inc. of San Jose, Calif., hooked into Cisco's CallManager call processing server. The fire and police services asked for the IP phones, Johnson said. 'The Navy is one of the early adopters' of voice over IP, said Mike Rau, director of engineering for Cisco's federal customers. Voice over IP service was just a buzzword in 1998, when the Navy began looking for an alternative to rewiring San Clemente. Real products were few and far between. 'We found a company called Selsius that actually had a working product,' Johnson said. Selsius Systems Inc. of Dallas was just rolling out its CallManager and IP phone products when Dyncorp asked for a proof-of- concept installation. It was not yet ready for prime time, however. 'It didn't have appliance quality,' Johnson said, citing problems such as echo and voice drop-out. Cisco acquired Selsius in 1998 and improved the product line. The IP desktop phone sets on San Clemente connect directly to the IP network. Voice packets travel over the ATM backbone and the microwave link to North Island, where they go into the CallManager, running on a Microsoft Windows NT server on the SCORE LAN. CallManager serves as a virtual PBX, routing calls and connecting to the switched telephone system over a T1 line. IP gateways on San Clemente also connect analog phones and fax machines to the IP system. The primary microwave link is backed up by a second, smaller link. The OC-3 connection is adequate at present, Johnson said, but if more bandwidth is needed, as many as four OC-3 connections could be carried on the same link. SCORE is now moving toward a complete replacement of analog phone service by voice over IP. Users also are looking for a stable voice environment. 'We've been pushing the envelope, volunteering to try each of the new software releases as they came out,' Johnson said. CallManager 2.4 has been stable enough that SCORE will not upgrade to the 3.0 version recently released. Johnson said he expects to wait for at least Version 3.1 before upgrading. SCORE probably will not do away completely with analog phone service in the foreseeable future, however, because of the need to maintain dial-up access to servers on San Clemente. 'Right now, voice over IP does not support modem links,' Johnson said. IP gateways work fine for fax machines but not as well with modems. 'You're lucky if you can get a 300-bps link. Short of that, we're in good shape,' he said.